The KPI Explorer provides an overview of the performance of all of your KPIs (Financial and Non-financial alike) – in one simple view. The KPI explorer helps to identify areas of strength or weakness in the business. You can sort by different perspectives to get further insights. A green symbol indicates that, for the selected period, a KPI has achieved a favourable result as compared to its Target (defined in 'Step 5 - Targets' of the company setup). A red cross, on the other hand, indicates an unfavourable result. 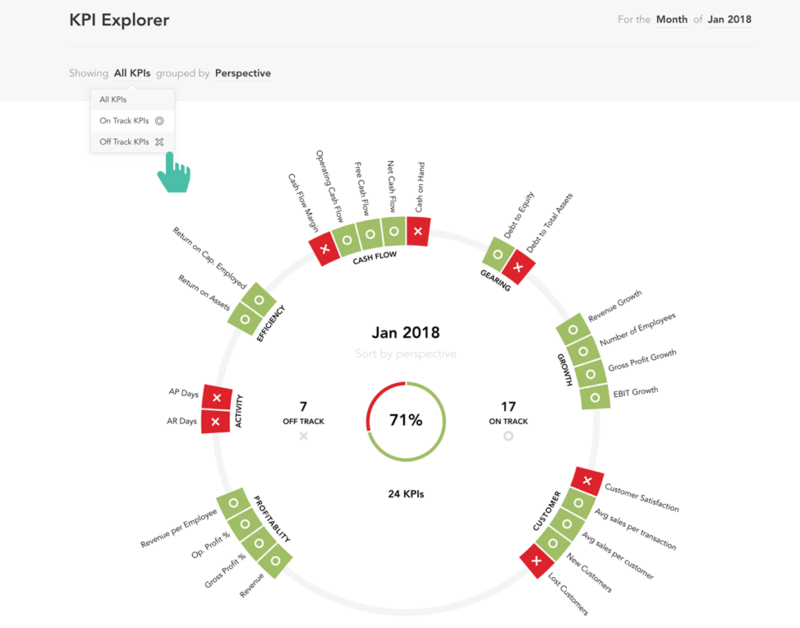 The percentage value in the middle of the KPI Explorer represents the percentage of KPIs which have achieved a favourable result – the percentage of those which are “On Track”. You are able to select 3 different ways to view the KPI explorer. To do so, select an option from the smart text. By default, the KPIs are shown by 'Perspective'. Perspective - view your KPIs based on different performance categories, such as profitability, efficiency, gearing, etc. Result - view your KPIs based on their performance for the period. KPIs on the far right have performed the best, whilst KPIs on the far left have performed the worst. Importance - view your KPIs based on their importance. The importance of a KPI can be set in ‘Step 4 - KPIs’ of the company setup. To find out more detail about a KPI, simply click the KPI result symbol. Additional detail on the KPI – including an explanation of the KPI, a summary trend chart, and other key numbers – will then show. Using the period selector in the top right, you can choose to view results for any month, quarter, or year. You can download the KPI Explorer to PDF from the menu bar, located at the bottom left of the screen. A PDF report containing the KPI Explorer is also available in the ‘KPI Summary’ report found in the 'Predefined Reports' section in the Reports Centre.